While parts of the country remains parched, northeastern states are reeling under the effects of one of the worst floods they have ever faced in the month of June. Assam has already received 104 per cent excess rainfall in a week starting June 20. Twenty-three of the 27 districts are flooded, displacing 300,000 people and killing 20. According to the Indian Meteorological Department’s regional meteorological department in Guwahati, the region has till now received 31 per cent excess rainfall in the month of June. Monsoons hit Assam on June 6. “Till date, the state has recorded 508.6 mm rainfall while the normal is 388.2 mm,” says Sunit Das, of the meteorological department. The intensity of the rainfall might increase in the coming weeks, he adds. 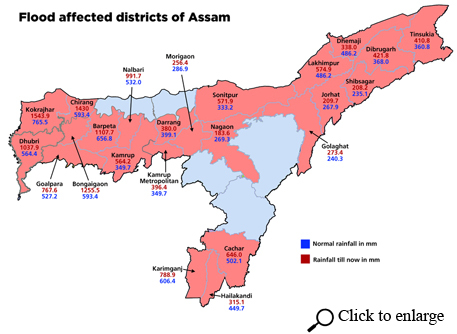 According to Assam Disaster Management Authority, 21,374.15 hectare, of agricultural land is under water in the state. The latest victims are from Sonitpur and Jorhat districts, where flood waters have swept away ten persons. Adjoining Arunachal Pradesh has meanwhile, received 78 per cent excess rainfall till now. Tributaries of the Brahmaputra that cross the state before entering the plains of Assam are wreaking havoc in Dhemaji and Lakhimpur districts displacing about 150,000 people. At Nimatighat in Jorhat district, the Brahmaputra’s water level was recorded at 87.21 metres on June 27, which is 2.17 metres above the danger level of 84.04 metres. The Brahmaputra water level in Dibrugarh district reached 106.27 metres on June 25 which is 57 cm above the danger mark of 105.7 metres. Last year, there was a deficit of 30 per cent rainfall in the month of June in Assam as well as Meghalaya and Arunachal Pradesh. Manipur state, on the other hand, saw a deficit of 67 per cent. It received 166.1 mm of rainfall against the normal 509.5mm. Nagaland, too, has received 24 per cent less rainfall—234.2mm against the normal 309.6mm. The Assam government has already started evacuating villages downstream of Brahmaputra including the river island of Majuli, which is facing rising waters of both the Subansiri and the Brahmaputra rivers. A 70-member National Disaster Response Team have reached the state for relief and rescue operation. Road and railway network between Barak Valley in south Assam and the Brahmaputra valley have been severed due to landslides. According to authorities, as many as 38 landslides have hit the region so far. A train carrying 1,500 passengers is stranded between Lumding and Silchar because of the landslides.